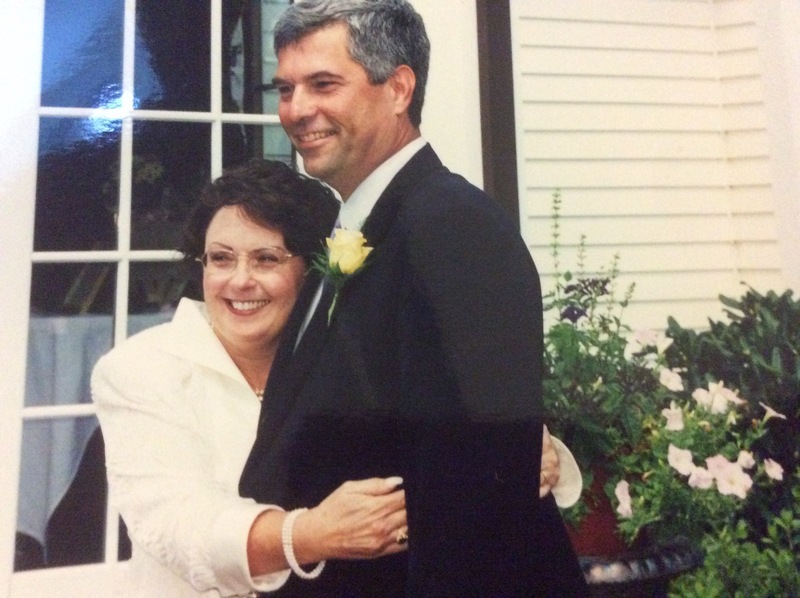 This week is our fifteenth wedding anniversary. We married late in life, so there was a lot of catching up to do and we make the most of every day we have together. When he was diagnosed with aggressive cancer eight years ago, the importance of time seemed to be looming over us each morning we woke, throughout every day, and in the darkness of the long nights. Holding hands, which we’ve always enjoyed, took on new meaning. Everything took on new meaning. And so this anniversary, the first one we are celebrating since he’s been declared in remission, is a special present for both of us. I’m not a card or gift person. Even before we were married, whenever he’d ask what I wanted for a birthday, an anniversary, Christmas or any special occasion, I would always say “Time”. (Although, I bugged him for quite a while to get his ears checked, which he finally did one Valentine’s Day. The hearing aids are still working fine, I might add. And now we can both be in the same room watching TV. So, in a sense, I did get more time together, even with that gift. He used to joke and tell people he loved his new hearing aids because he could turn off the one closest to me whenever he got the urge. Gotta love ’em!) And so, last Thursday, around midnight, we grabbed a blanket and jumped into his apple red convertible. This is his second convertible since we married. Before we were married, I asked him if there was anything he’d always wanted (besides a fantastic catch like me). He assured me I was all he needed. 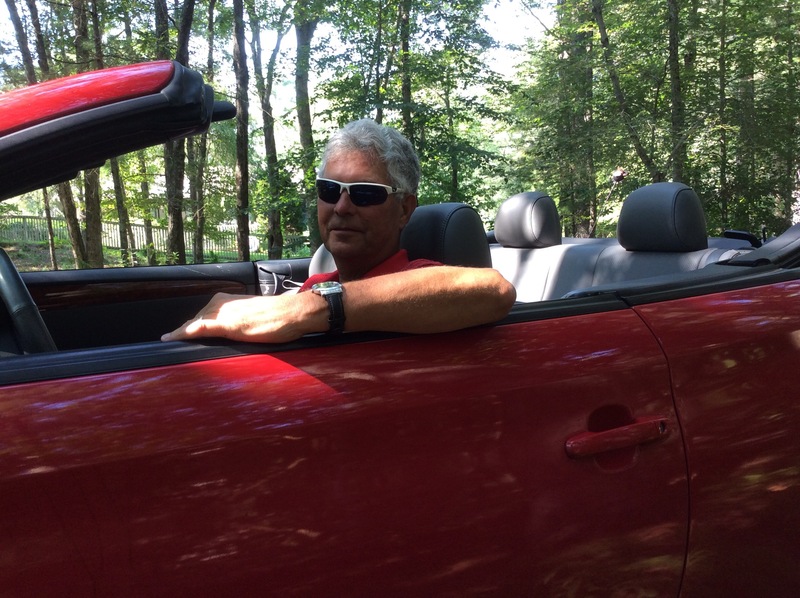 With a little more coaxing he confided that he’d once dreamed about having a red convertible. When we arrived in our spiffy, new car with the top down for the wedding reception, his friend Mike looked at the automobile asking incredulously,”Is this your mid-life crisis?” Charley, without skipping a beat answered, “Oh, no. Clare’s my mid-life crisis.” Gotta love ’em! And so, as the first hours of Thursday approached, we drove down our road to sit in the darkness and watch the stars streaking through the heavens. We pointed and screamed and held hands. It was a lovely night and we filled it with our laughter. It started me thinking. He’s been talking for years about taking an astronomy course. He loves science. As I said, I’m not a card or gift person, but this year I am giving him a surprise: membership in Skyscrapers www.theskyscrapers.org It’s a group founded in 1932 as the Amateur Astronomical Society of Rhode Island by Dr. James Smiley of Brown University. The society meets at Seagrave Memorial Observatory and has a restored 1878 Alvan Clark refractor and some incredible telescopes. They have lectures, discussions and trips and they lend out portable telescopes to members. I’m getting a membership for me, too, so we can share his love of astronomy. He’ll be reading this as soon as I post it. He’s my biggest follower so, Happy Anniversary, Honey! I love your world (and sky) view Clare. You are truly living your life and love. I live on the eastern seaboard of Australia. Ours is largely a beach culture and tourist destination, although also a favourite place for retirees. It is Sunday lunchtime here and the weather is cool for us. We are approaching spring so before long I’ll be a model of industry in my garden as things shoot and bud. Thanks, Robyn. For some reason it’s not showing up on our Mac?? I’m glad it isn’t an overall problem. I really wanted to share it with people. Appreciate another set of eyes on the other side of the world. Wow I loved reading this! True love does exist! Yes when I read your post, it made me beam, but I also knew it was not easy getting where you are!! So I admire that so much!! So nice you shared this! I have been remiss. Wishing you and Charlie all the best for your anniversary Clare and for all the ones to come. I just showed this to Charley and we both thank you from the bottom of our hearts. You and Charlie have something very special Clare as I’m sure you are aware. I am grateful that you aren’t missing a moment of it. Hey, I miss you!. I’d love to chat some early morning soon. The blog is not frustrating me as much as when I first started out. I still have a lot to learn, but would never be at this point without your help. You can’t know how much I appreciate that, Peg. I wrote a great little piece about a baby pitcher plant that refuses to eat meat. It’s in verse and there are pics, too from the Botanical Garden at Roger Williams Park. Do you want to take a look at it? I mailed in the form yesterday, so definitely tell Linda we’ll be joining up. “To the moon, Alice!” Have a great week and I’m so happy to wake up to your note this morning!. Dear Clare and Charley, Happy Anniversary, and many more from a new friend. You only asking for more time, then getting him a red convertible is the most romantic thing I’ve ever heard. Congrats on being cancer free, Charley! Wow, single for 50 years, you’re a strong woman. Oh yes, Pudding Pop is my heart!! Good for you, taking care of him so well. haha, you have a strong man there who knows his mind! Good thing! 😉 Oh, thanks! We’re looking forward to doing something together and of course, holding hands. Thank you from both of us! Clare, Happy Anniversary to you both! It’s nice to know that while we were watching the Perseid meteor shower, we were also watching your celebratory astral fireworks! Here’s to many more anniversaries! Clare, your words inspire me and bring tears to my eyes. Happy anniversary! I wish you both all the best in the years to come! Happy Anniversary. Here is to many, many more. Cheers! Hi again! I love your blog and I have nominated you for a Liebster award. Visit the Liebster Award post on my site http://musinwithsusan.wordpress.com to find out more about how this works. How lovely! My husband and I will be celebrating our 22nd anniversary in September, and for the past several years, all we have wanted is “Time.” We used to exchange gifts and cards, but then we realized that we had what we wanted in each other, and to celebrate that, we now just devote some time to remembering how lucky we are to have each other. Love makes all the difference! You know, you can get more of anything else if you’re determined enough, but when time is gone, it’s gone. If more people thought like that, marriages would thrive. But it takes two and if only one values time, than the battle is almost lost. If I don’t remember, have a lovely September anniversary together! Thank you so much! You’re so right; it does take two. You and I are lucky to have found people who value time like we do. If I happen to forget in September, I’m wishing a very happy anniversary to you both right now. You have a wonderful relationship – I love this story. As you say, each day, each moment is precious, and my husband and I feel that more and more each day. Fortunately, apart from aches and pains, our health is not too bad, but we are slowing down for sure. We have been married for fifty-three years. How can I resist a post titled ‘I’ll give you Stars and the Moon’ …. love late in life can be the best of all and yours clearly is. Time is the most precious gift of all – none should be wasted – you so clearly understand this but what I love is the lightness and laughter even through the tears that must have been shed freely along the way. Oh, many tears, which is why we grab at every chance for laughter and can be very silly at times. Our perspective is certainly skewed by the experiences we’ve had in the last eight years of operations and clinical trials. Any opportunity to have fun is never wasted on us. You, my friend are a girl after my own heart. I send the warmest wishes to you and your husband for many more laughs to come – carpe diem was clearly written for you! !